"You choose the Two Week Package that is right for you! We are here to help make sure you succeed!" Pick the engine you want. Continental 0-200D or the Rotax 912 ULS or the ULPower 350iS. Everything is supplied for full installation. For the Super Duty STOL, the Titan by Continental Motors, the X370 Series Engine at 185-205hp. Other similar engines are available such as the Lycoming 0-360 (180 HP). Add a $15,000.00 avionics package. GARMIN G3X Touch or DYNON SkyView Touch. Both come with a COM Radio, Two-Place Intercom, Transponder and more! 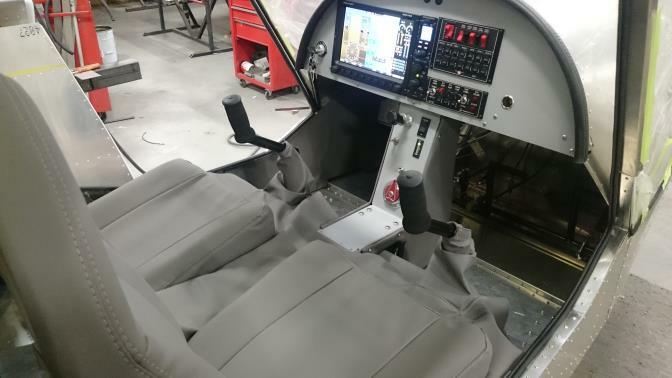 Above photo is a typical example of a completed 2 week STOL CH750. Installed is the 10" touch screen by Dynon. Customer purchased the dual stick option and upholstery kit. Engine choice was the ULPower. Upholstery will be removed at the customers airport for aircraft painting. NOTE: Two-Week Wonder Programs require some careful planning and scheduling. Call to discuss your scheduling needs - and ours. Not included in program: Custom modifications, cabin finishing and interior and/or exterior paint.